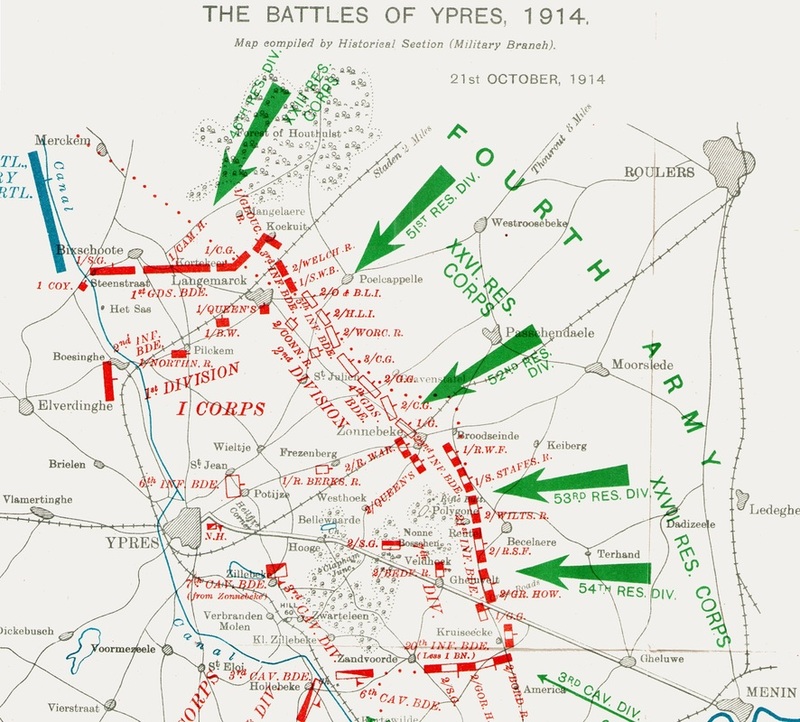 FIRST BATTLE OF YPRES. - LANGEMARCK. The 1st Army Corps moved immediately after its destination had been settled, the 2nd Division receiving orders to join up with the left of the 7th Division. The 4th (Guards') Brigade on the right of the 2nd Division met with a good deal of opposition before gaining touch with the 22nd Brigade (7th Division) to the north of Zonnebeke. On the same day (21st October) the 5th Brigade, on the left of the 4th, advancing towards Poelcapelle, at once became heavily engaged with the enemy, and during the fight which ensued suffered con­siderable losses. After the fight, the 1st Army Corps found the resistance so severe that it was forced to stay its advance, consolidate the ground gained, and endeavour to withstand the shock of the German attacks, which were delivered during the next two days and nights. The general situation of Sir John French's army at the end of October. Taking the line from south to north : Givenchy-Fromelles-Ploegsteert, occupied by the IInd Army Corps, IIIrd Army Corps, and 19th Infantry Brigade, with the Lahore Division and Conneau's French cavalry in support. Then, for some eight miles, between Ploegsteert and Hollebeke, came Allenby's cavalry, linking up the IIIrd Army Corps with the 7th Division(Capper). And, lastly, the northern part of the line, Hollebeke-Ypres-Langemarck, held by the 7th Division and the 1st Army Corps, with the 3rd Cavalry Division (Byng) and a French Territorial Division in support, and another French Territorial Division on the left of the 1st Army Corps. Lieut.-Colonel H. R. Davies's Diary. October 20th.—(Poperinghe to near Pilkem, 9 miles.) Not a very long night to enjoy our billets, as we were on the march again at 6.45 a.m., moving via Elverdinghe to Pilkem. Here a lot of French Territorials passed us retiring. The Brigade was put into a sort of outpost line from 1 mile south-east of Pilkem to Steenstrate. The part taken up by the Regiment was from near Pilkem towards the north-west, the Highland Light Infantry being on our left near Steenstrate, and the Worcestershire on our right. Some rain at night. Headquarters were established in a little farmhouse, where we got shelter, but not much sleep. A Company were also in shelter in some buildings of the same farm, as they were in reserve. The other three companies were chiefly in trenches which we dug in the evening. We have not seen any of the enemy today, and an attack by night does not seem likely, as the country is a good deal cut up by ditches. October 2lst.—(Fight near Langemarck.) About 3 a.m. I was sent for to go to Brigade Headquarters (in the village of Pilkem) to get orders. The Brigade was ordered to rendezvous, at 6.30 a.m., at the road junction half a mile north of St. Julien. When we arrived at this rendezvous, orders were received that the 1st Division would attack Poelcapelle from Langemarck, while the 2nd Division, on their right, would advance on Passchendaele, the movement to be by the left, i.e., the 1st Division directing. The 5th Brigade orders were that we on the left and the Worcestershire on the right were to be in front line, the Highland Light Infantry on the left, and the Connaught Rangers on the right in second line. I deployed along the Langemarck-Zonnebeke road, with our left on the Haanixbeck (Also known as Lekkerboterbeek), so as to get touch, with the 1st Division. Front line, was C Company (Ponsonby) on the left, D Company (Harden) on the right; second line, B Company (Wood) on the left, and A Company(Kirkpatrick) on the right. Brigade Commander (Lieut.-Colonel Westmacott, Worcestershire Regiment), told him, and received orders from him to advance. By this time shrapnel had begun to fall, but it did not do a great amount of harm. The advance began, the men going forward under fire excellently. Bullets came almost at once, and it soon became evident that most of our losses were from fire from the left front, from ground which the 1st Division were to attack. A good many men were hit, but in spite of losses we advanced quickly and steadily, delay being caused chiefly by the difficulty of getting through the thick fences. We finally got a line with our left about the c of Haanixbeck(Map 1/1000,000) Hazebrouck sheet), and our right joining up with the Worcestershire on the lower part of the Stroombeek. Here the fire from the left enfiladed us, and the Captain of the South Wales Borderers' Company sent a message to say he was in front of the rest of the 1st Division, who did not seem to be coming on. It was obviously impossible for us to go on unless the 1st Division came on also, so we stayed where we were, hanging on to the ground we had gained. The Germans had trenches in front, the nearest being about 300 yards away, along the track which leads from near the junction of the Haanixbeck and Stroombeek to the m of Langemarck. Their men could be seen running into these trenches, either to occupy them or to reinforce them, and our front line was able to shoot a good many of them as they did this. I had been coming along with A Company on the right of the second line, and at this stage got into the upper storey of a farm­house (shown on the map as New Houses), about 200 yards behind our front line, just north of the Kilometre post 7. From here I could see to some extent in three directions. I kept looking northwards, hoping for the appearance of the 1st Division, but nothing more appeared beyond the one company of the South Wales Borderers, who, unsupported on their left, were unable to advance any farther. From the front and right front there were movements of Germans towards the front of the Worcestershire on our right, but they were well taken on with shrapnel by our artillery, and they made no real attack in that direction. The fight was now becoming stationary, and remained so for the rest of the day. There were occasional outbursts of firing, but at other times it died down almost entirely. I had sent messages to say that we wanted the 1st Division up in line with us before we could advance farther, but they did not come on." At dusk we began to entrench. It was a fairly good line that we had got, and a company of the Highland Light Infantry, under Mayne, came up on our left, and filled a gap between us and the company of the South Wales Borderers. During the night we were able to get up rations and ammunition, also the big entrenching tools from the tool wagons; and water-bottles were filled at the farm where I had my headquarters. A great many of the wounded were brought into our farm, but there was some delay in getting up the ambulances, owing, I believe, to a mistaken order having been given to them by someone to turn back when they were on their way up. Having some 50 wounded in the farm, with the probability of its being shelled, was a great anxiety; but to my intense relief some motor-ambulances arrived just in time, and we were able to get all the wounded away before daylight. This was our first big fight. The men advanced splendidly, and officers and N.C.O. 's did their duty magnificently. There was always an absolute readiness to advance on the part of the men. Our losses this day were about 220 killed and wounded, (Killed 4 officers + 1 died of wounds & 61 men, Wounded 5 officers & 143 men, Missing believed killed 3 men: total casualties 217 all ranks. We had a quiet night as far as lighting went, but much work in digging, and serving out rations, ammunition, and water, as well as in bringing in and sending away the wounded. The stretcher-bearers did excellent work. October 22nd.—(On the Haanixbeck—near Langemarck). During the day there was not much infantry fire, nor was there much artillery fire on our portion of the trenches. I was still able to live in the farm most of the day. The companies in our line were much mixed up, and I did not try to sort them out. It was much better for the men to remain in the trenches which they themselves had dug, and watching ground which they knew. Officers were in charge of different parts of the line, usually with some men of their own company and men of other companies mixed up with them. In the late afternoon the Germans began to shell us. They made rather a special mark of the farm, and soon succeeded in setting it on fire. However, I had had a good trench already dug behind the farm, and into this Regimental Headquarters moved without having any casualties. In this attack the Germans came on in thick lines, but our men were very steady, and we lost only 1 killed and 1 wounded. Another 6 men were killed and 8 wounded at other times today. During the day I had had orders that the Worcestershire and ourselves were to retire after nightfall to a position about half a mile behind, so as to be in line with the 1st Division. I protested strongly against this, as we were well able to hold our position and it did not appear difficult for the 1st Division to advance until level with us. My protest was forwarded by Westmacott to General Monro, commanding the 2nd Division, who replied that although he appreciated our disinclination to give up the ground gained, it was necessary for us to retire, so as to conform to the general line of the army. To my great relief, however, the order to retire was cancelled at night—possibly because of the attack which the Germans had made. considerable part of the night was spent in burying our dead of yesterday. October 23rd.—(On the Haanixbeck, near Langemarck.) A good deal of artillery fire, and sometimes infantry and machine-gun fire from the German trenches. In the afternoon they shelled both the farm and the trenches. A trench just west of the main road, where Baines was in command, was smashed in by H.E. shells, but the men luckily suffered little harm. They were ordered to retire about 50 yards, until the shelling subsided, and re-occupy the trench if the German infantry attacked. The result of the attack was as before; some Germans got very close, but in the end they turned and ran back behind the next hedge, 150 yards off. Here they remained for some time, with a good deal of shouting, which appeared to come from officers trying to get their men on again. Anyhow, no further assault was made, and they evidently retired to their own trenches. (The enemy’s losses must have been very severe for the French who relieved us afterwards reported that they counted 740 dead Germans the next morning in front of this part of the line) Our casualties were 2 men killed and 5 wounded. Ponsonby and Humfrey were also wounded. In the evening we received orders that the French were to relieve us here, and, at about 10 p.m., the French 125th Regiment arrived and took over from us and the Worcestershire. The first part of the relief went off quietly, but just as we were beginning the relief of the part of the line west of the main road, rifle and machine-gun fire started from the enemy's trenches, and some shrapnel was fired at the farm and the road. This interrupted matters, as we had to lie down while the firing was going on. Afterwards the relief was interrupted three or four times in the same way; but we got through it at last. Luckily none of our men were hit during all this, but I believe that both the Worcestershire and the French lost a few men. Lieut. G. M. R. Turbutt. 2nd Lieut. L. A. Filleul. 2nd Lieut, F. W. C. Chippindale. Total casualties, 217 officers and men. The missing are probably all either killed or wounded, as we held all ground gained, so it is practically impossible that there should have been any prisoners. while on the 23rd October 2 men were killed and Captain A. W. N. Ponsonby, 2nd Lieut. D. H. W. Humfrey, and 5 men were wounded. Map from The History of the Second Division. Poelcapelle British Cemetery. It was here that many of those lost in October 1914 were reburied after the war. 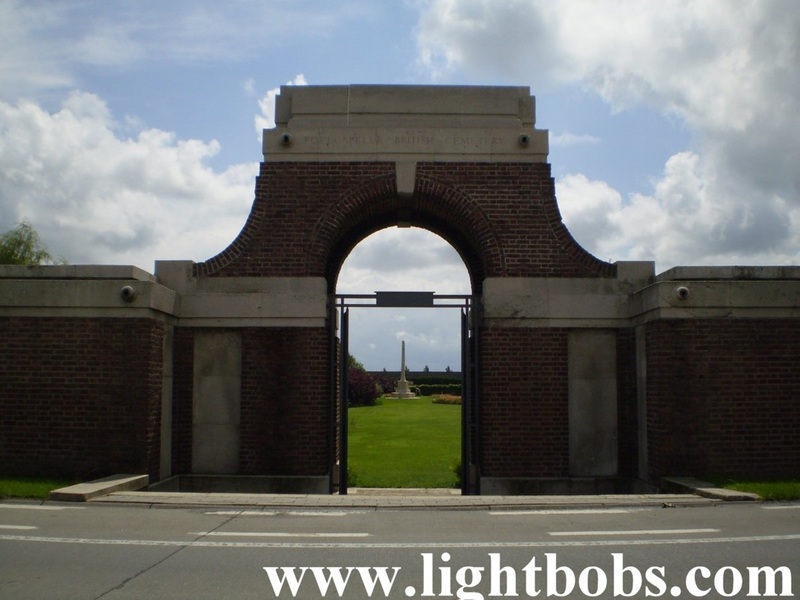 Only 5 officers and men have identified graves 55 others are commemorated on the Menin Gate Memorial to the Missing in Ypres. 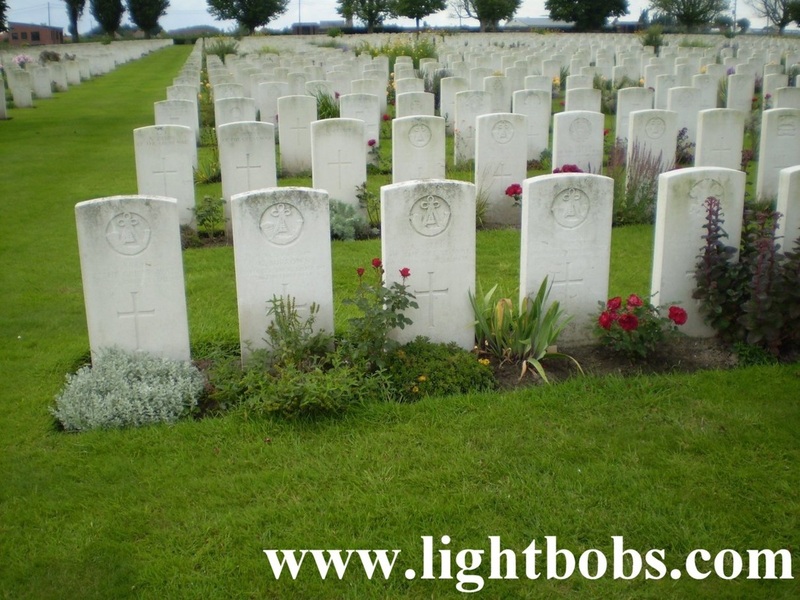 In 1917, Major-General H. R. Davies, C.B., then commanding the 11th Division, erected a memorial cross on the site of this Regimental Grave: “in memory of 5 officers and 70 n.c.o’s and men of the 52nd Light Infantry, killed in action October 2lst-23rd, 1914, some of whom are buried near this spot “ This memorial was later moved to the Poelcapelle Military Cemetery.